Wladimir Klitschko has pulled out of his fight with Tyson Fury on 24 October because of a calf injury. Ukrainian Klitschko, 39, was due to defend his WBA, IBF and WBO heavyweight titles against Britain's Fury in Dusseldorf, Germany. "It's a bit funny as I predicted this would happen!" tweeted Fury, along with a emoji of an old man. 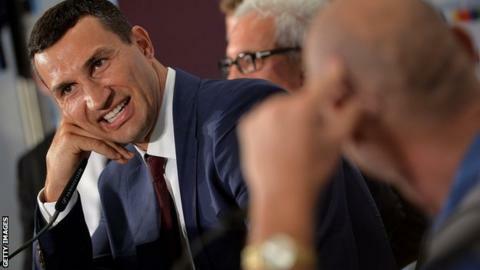 Klitschko told Bild he was "incredibly sorry", adding in a video message that he was "working hard on rescheduling". Fury, 27, had called Klitschko "boring" in the build-up to the fight and attended Wednesday's news conference dressed as Batman. The fight would have been a record-breaking 28th heavyweight title bout for Klitschko and his 19th defence in his second reign as world champion. Fury had earned his shot after forcing Dereck Chisora's 10th-round retirement in his fight against his fellow Briton in November. He has won all 24 of his professional fights. The Bolton fighter has been left frustrated twice before. Domestic rival David Haye pulled out of an original September date with a serious cut and then withdrew again two months later with a shoulder injury. Klitschko secured his own victory over Haye in July 2011, with the Londoner claiming he was hampered by a broken toe in the wake of a points defeat.